RESTON, Va., December 13, 2005 ��� Baseball Hall of Famer Bob Gibson recently offered a valuable piece of marriage advice: Take your spouse on frequent recreation vehicle (RV) vacations. 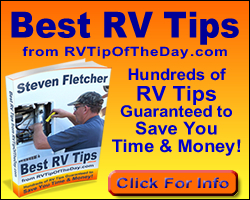 ���One of the nicest things about RVing is my wife actually smiles at me when we get inside�Ķ she���s always in a good mood in our motorhome,��� Gibson said, sharing his firsthand experiences with an audience of RV industry executives. The former St. Louis Cardinal pitcher received his first RV as a retirement gift from the team in 1975. Gibson and his wife, Wendy, have been on the road ever since. ���[Team owner] August Busch asked me, ���What do you want when you retire? We want to get you something spectacular,����� Gibson recounted. ���Of course, I wanted a motorhome,��� revealed Gibson, regarded as one of baseball���s all-time greats. With 50,000 fans watching, Mr. Busch surprised him by driving the motorhome right into the stadium, Gibson recalled. The couple has owned seven RVs over the past 30 years, including their current Itasca Horizon, a 40-foot Type A motorhome. Most of their RVs were purchased from RV dealer Bill Thomas of Bill Thomas Camper Sales, Wentzville, Mo., who has become a personal friend. The Gibsons��� new RV has all the comforts of home, including a kitchen, bedroom, bath and living room. Among the state-of-the-art amenities in their motorhome are ceramic-tiled floors, flat-screen TVs, surround-sound CD and DVD players, queen-size bed, satellite TV and radio, and rooms that expand at the push of a button to create extra space. ���I���ve had a lot of interesting experiences [on the road]. RVing teaches you a little humility,��� acknowledged Gibson, sporting a relaxed appearance, fit and younger-looking than his age. Intimidating and dominating on the mound during his 16-year career with the Cardinals, Gibson won two Cy Young Awards, two World Series MVP awards, nine Gold Gloves and the National League MVP trophy in 1968. That year���s season-long performance is frequently referred to as the greatest ever by a pitcher. He was also named a member of baseball���s All-Century Team. Gibson made his remarks at a November 29 award ceremony in Louisville, Ky., during the opening breakfast of the 43rd Annual National RV Trade Show, the industry���s premier business event sponsored by Recreation Vehicle Industry Association (RVIA). Recognizing him as an exemplary representative of the traditional American values inherent to RV travel, industry officials honored Gibson with RVIA���s Spirit of America Award. The award was presented on stage to Gibson by RVIA Chairman of the Board Bruce Hertzke, chairman and CEO of Winnebago Industries; RVIA President David Humphreys; and RVIA Public Relations Committee Chairman B.J. Thompson, president of B.J. Thompson Associates, Inc.
Order a free RV ���getting-started��� DVD or CD-ROM at 1-888-Go RVing or GoRVing.com. Surf the website for lists of Go RVing dealers and campgrounds in your area, as well as RV shows, publications, rental sources and clubs. Or write to: RVIA, P.O. Box 2999, Dept. P, Reston, VA 20195. RVIA (rvia.org) is the national association representing more than 550 manufacturers and component suppliers producing approximately 98 percent of all RVs made in the United States.